Covenant University Postgraduate Programme Admission Form for 2017/2018 academic session is out and on sale. The management of Covenant University Postgraduate School welcomes applications from qualified candidates for admission into the University’s postgraduate programmes for the 2017/18 academic session. The University wishes to inform interested candidates that admission is strictly by merit as nobody should offer or receive compensation (monetary or material) to influence any candidates admission. 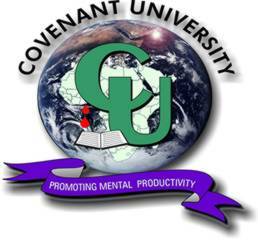 Covenant University offers Postgraduate Dipoma, Masters degree and Doctorate degree programmes. There are general and specific requirements for admission into the Postgraduate programmes of Covenant University. The following contains the requirements for admission into the different Postgraduate programmes available in the University. An applicant must satisfy the general University requirements as well as any special requirements for admission into the programme of interest. An applicant shall complete the application form on the University portal and ensure that the information submitted is accurate. The applicant shall provide all relevant documents, including certificates of degrees and/or diplomas, academic transcripts, reference letters, etc. as specified on the application form. An applicant shall request and ensure that all institutions attended process and forward official academic transcripts (undergraduate and/or postgraduate) to the School of Postgraduate Studies. Transcripts must be received directly from the applicant’s institution. Applicants who are Nigerian citizens shall, in addition, provide their National Youth Service Corps (NYSC) discharge, exemption or exclusion certificate. Below are the requirements specific to each of the postgraduate degrees offered by the University. Candidates must possess these requirements to be admitted. Bachelor’s Degree with not less than third class Division in the same or related discipline from Covenant University or a University recognized by the Senate. Bachelor’s Degree with at least second Class lower Division in an unrelated discipline may be considered. Higher National Diploma (HND) with a minimum of Lower Credit. Applicants with relevant professional qualifications may be considered.In addition, a candidate shall obtain credit passes in at least five (5) subjects, including English Language and Mathematics, at the Ordinary Level examination of WAEC/NECO/NABTEB. Bachelor’s degree in relevant discipline with at least second class lower division from Covenant University or any other university recognized by the Senate. Postgraduate diploma (PGD) with a minimum CGPA of 3.5 in addition to a Bachelor’s degree (minimum of third class Division) or HND (minimum of Lower Credit) in a relevant discipline may be considered. Applicants with relevant professional qualifications such as ACA, ICAN, ACIB, etc. who do not have either B.Sc degree or HND, would need to obtain the relevant PGD before applying for the professional Master’s programme of the University, such as MBA/MPA/MIT, etc. Bachelor’s and Master’s degrees [M.A/M.Sc/M.Eng/M.Tech] in the relevant discipline obtained from Covenant University or any other university recognized by the Senate. A minimum CGPA of 4.0 on a 5.0 point scale or equivalent in the Master’s programme to qualify for a direct entry into the Ph.D degree programme. Applicants with CGPA of 3.50 – 3.99 on a 5.0 point scale or equivalent in the Master’s programme may be considered for M.Phil/Ph.D programme. Applicants with professional Master’s Degrees shall not be eligible for Ph.D programmes except they obtained M.Sc degrees in the relevant fields. • Industrial/professional experience via Covenant University’s internship programme. • Certificate/Diploma programme in Leadership. After a successful creation of the account, login to the account and complete the online Covenant University Postgraduate Admission Application Form. The payment page is displayed by clicking on the submit button after you have successfully completed the online form. The cost of the Covenant University PG application form is N15, 000.00 (Fifteen Thousand Naira) only. Additional transaction charge of N600.00 and N900.00 for bank or online payment respectively. Payment can either be made at these banks (Covenant University Microfinance Bank, Ecobank, First Bank and GTBank) or online; you are expected to select the card payment option before you can proceed. Card Payment via the Internet: You can make payment using your ATM card. After successful fee payment, you are expected to upload your passport, after which your application number is displayed (please copy it).